The idea of a Hope Chest symbolizes so many hopes and dreams... building a family legacy—a heritage. A Hope Chest is really nothing more than a wooden chest, a closet, a storage unit, or a large box full of items that have been collected over time. But inside that object, is something much more special—it's a place where one places all her treasures and dreams, as she waits for life to unfold..." ~Alyice Edrich, from the parent site. I love the idea of a hope chest. Although in our time we ladies do not need dowries, many of us love the idea of collecting things for our own house someday: things which someday we will be able to use in our own kitchens, our own dining rooms... our own beautiful little things to hang on the walls or drape over a chair. We like to collect things from our travels, thinking to ourselves "some day I'll put this in my own bathroom, " or "someday I'll use this basket for my baby socks"... It is a joy to collect all these miscellaneous items for the future. I never really had a "home" between the time I was living with my family and then married. I was always living in rough conditions, i.e. camping, living in cabins, or sharing an apartment with someone for a few months. But when I got married and my husband and I had our own apartment, it was monumental for me to be able to FINALLY, unpack the old stuff I'd been collecting in old cardboard boxes. I filled my home with treasures... I may not have been collecting furniture, but I had many other, more important treasures, which were such a joy to finally use and see day-to-day. One thing I always wished I'd had over all those years, though, was a beautiful wooden chest of my own to hold these many items. Traditionally, though, a hope chest was used by the MOTHER to collect things over the years for her daughter, preparing her for marriage. She would place the neccesities into the chest: table linens, bed linens, candleholders, etc. I think that this is equally special! 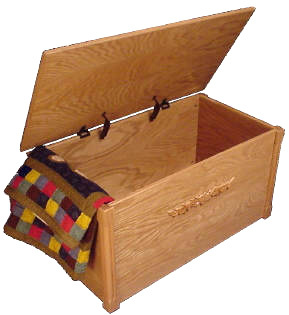 Now, as I start of my life as a mother of God-knows-how-many children, I am faced with the question: Do I provide my children with a hope chest which I give to them at a younger age, or do I surprise them with their own which I assemble for them over the years, giving it to them when they're 18? I've decided to do both, sort of. I took so much joy in collecting all my own treasures over the years that I want to, and will, encourage my children to do the same. But My husband and I have many fun ideas for making up our own chest for each child. My husband is going to make a chest for each one, and over the years we hope to fill the chests with items which we want them to be able to cherish later: such as a few useful kitchen items or tools, keepsake items such as their first drawings, their first paintings, their first stories...I also hope to occasionally do a tracing or handprinting of their hands in clay and fire it for them. That could go in there, too. There are also little peices of HOME which we hope to include, but we don't know what this will be yet. All this being said, I will sign off for now. These are just some little thoughts on this dear tradition.